There are three main components – the control console, the network expansion panel (NEP) and the remote units (disabled refuge, fire telephone, steward telephone, roaming telephone, disabled toilet alarm). Remote units are wired in a radial (star-wired) configuration. Control/NEP panels are loop wired. For mounting positions of the outstations please refer to: EVC mounting heights. Any number of jack sockets (for the roaming telephone) can be daisy chained (up to 500m). One handset will be operational per line at any one time. All outstations are powered from the line, including the roaming telephone enclosure and disabled toilet alarm. 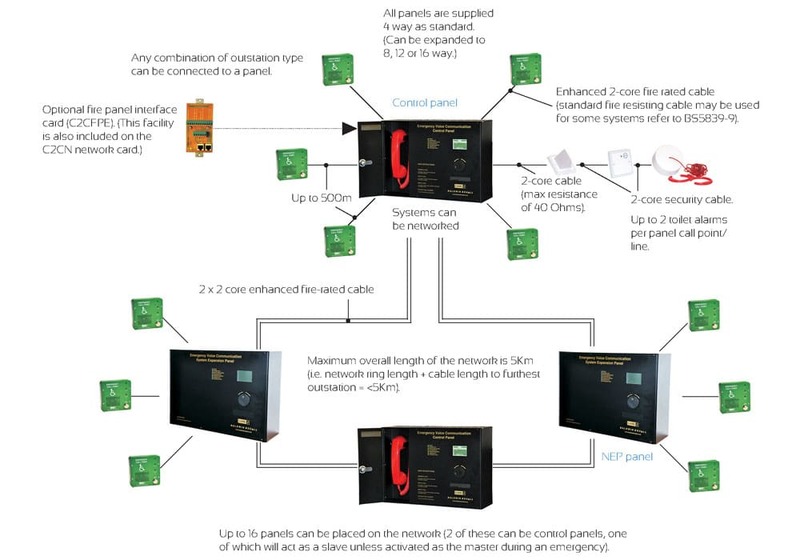 Any combination of outstation can be connected to a panel. Fire rated enhanced two core cable with a screen must be used in a system used for fire fighting. Standard fire resisting cables could be considered suitable for some EVC systems (please refer to leaflet or BS5839-9 for more details). Disabled toilet alarms – two core, fire resisting to first DTAKIT with max resistance of 40 Ohms (spur to second DTAKIT – two core security). Network loop – 2 x two-core fire resisting cable (enhanced recommended). Up to 500m cable run between each remote unit and the control/NEP panel. Up to 500m cable run between each control/NEP panel. Maximum overall length of the network is 5Km (i.e. network ring length + cable length to the furthest outstation = <5Km).